You asked. We delivered. Introducing IBM WebSphere Commerce Version 9. With rapidly changing markets, evolving customer expectations and new competitive challenges, brands need the speed and flexibility to quickly adjust their go-to-market strategies and transform how they engage customers across channels. 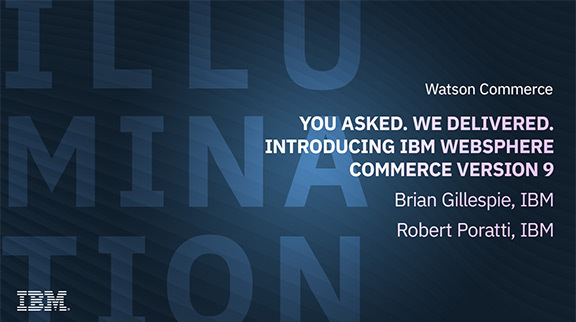 Join Brian Gillespie, IBM Watson Customer Engagement Technical Leader, and Robert Poratti, IBM Watson Commerce Product Marketing, to learn how WebSphere Commerce Version 9 addresses that challenge with a new, modernized architecture aimed at speeding innovation and reducing the time spent managing the platform. You'll also learn how Version 9 uses a microservice approach and the latest in open source technology to reduce your commerce platform footprint and total cost of ownership.